So for May 2015 NOAA says the globe is at 0.87°C above normal, and UAH says the globe is at 0.27°C above normal – a difference by a factor of three. It makes no sense to talk about factors of three when discussing temperature like that. If the temperature here is 23C and there is 20C and the baseline is 20C, therefore the anomaly here is 3C and there is 0c - does that mean that here is infinitely different to there? Anthony might live in the clouds. The rest of us live on the surface. Bob subsequently corrected his article, but Anthony's mind got stuck in Bob's initial error. Is there anything else odd about this? Yes, there is. So far no-one has remarked on Anthony claiming that the NOAA is about to release the May temperature report, instead of the June one. Or the strangely mixed up article he wrote, in which he appeared to be talking about a future May 2015 report, at the same time as talking about a previous May 2015 report. Oh, and yes, May was the hottest May ever in the NOAA record. And for all Anthony's trying to persuade his readers that the seas weren't really very hot, I've put together charts of sea surface temperatures - ERSSTv4, for HadSST1 and Reynolds OI v2. They differ from each other, but for all of them, May was the hottest on record. NOTE: The charts are just for the month of May each year - not the annual average. 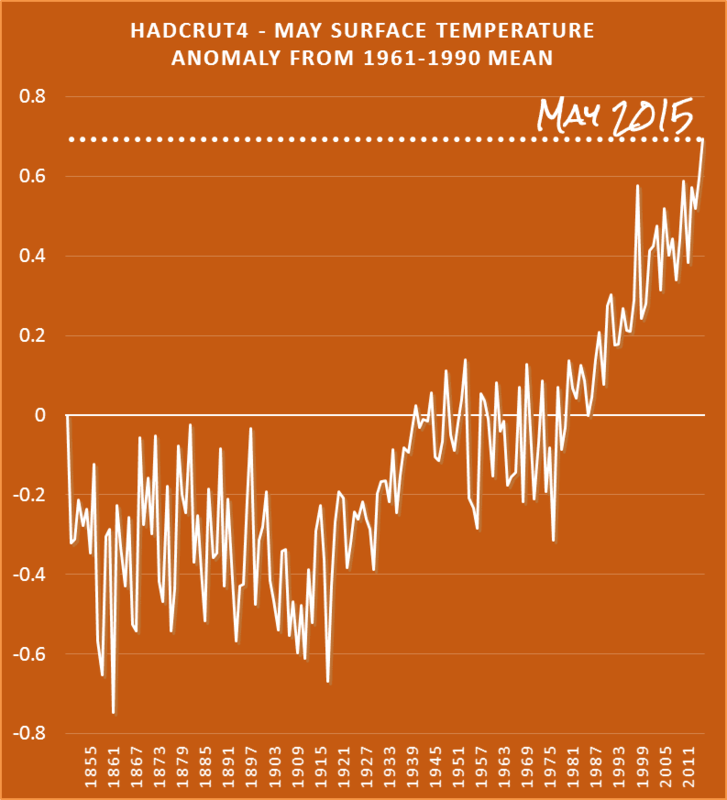 And it was by far the hottest May on record for HadCRUT4 (global land and sea surface). Again the chart is only for the month of May each year - not the annual average. So… we can stop worrying about how a two degree increase is going to kill everything? Good point, I’ll add that. Even a 2C increase won’t kill everything. NOAA is looking at the Oceans and UAH is looking where the effects of CO2 are manifest – in the air. So why not believe them both? It just means that natural variation (water sloshing about) overwhelms the greenhouse effect. As water has a far higher thermal capacity than air it’s what anyone with secondary school physics would expect. Thanks for the “heads up.” Usually these press releases are dropped like a bomb on the science community, so if some enterprising reporter were to actually look for contrary commentary, any skeptics would be caught short. Forewarned is forearmed. The divergence between the cooked data and the reality on the ground is becoming ridiculous. Eventually the cold hard facts of real weather/climate will overcome the mindless propaganda being spouted by NOAA and the rest of the Climate Lying establishment. People will finally wake up and realize they are being lied too. GISS June in at .76C, which I believe ties 1998 as the hottest Junes in the record. So they are now using ERSST v4. Well now... a lot of months have change by .10 or more. To say that deniersville ain't going to like this one single bit is something of an understatement. While we all know the latest SST adjustments make the distant past warmer and thus reduce the overall trend... the 2014 average, for example, has gone from .68 to .75! Yes, there will be much wailing and gnashing of teeth out there, and the scientists will of course be accused of cooking the books now more than ever before :-\ I just have to see this plotted. Sou, can you oblige? 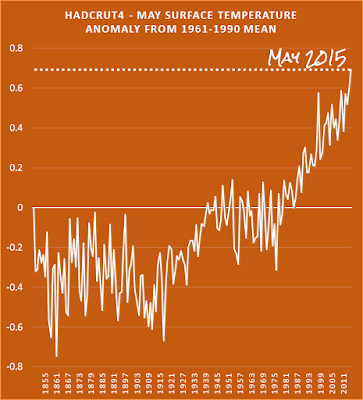 BTW, it makes the 2015 YTD average anomaly a sweltering .80. I've updated the YTD for June - so you might want to talk about it there. Just checked again and 2010 and 2015 are neck and neck for the month of June. 2015 is equal top. I made a slight mistake in the June YTD. It's fixed now. Apologies for the diversion, Sou. Back on topic for this thread. I've always found it more than slightly ironic that the proprietor of the self-proclaimed "world's most viewed site on global warming and climate change" doesn't understand the most fundamental thing about temperature anomalies: baselines. No wonder Anthony and his army of numpties like the satellite records so much; for starters, they have more recent baseline periods than the land-based records, so the anomalies don't look so scary to the innumerate. Climate Change no Headline change definitely. He he - is Anthony Watts a secret fan of HotWhopper? I'm sure he is - at least, his browser history probably gives that impression. Fan may be too strong a word Sou, but he is becoming more and more reliant on you. Anthony's posts are so badly constructed they make Bob Tisdale look like a scientist. Ha! Priceless.I'll never tire of their cognitive dissonance. The deniers don't seem to understand probabilities, or uncertainty for that matter. I have pointed out to them in various places that uncertainty is no-one's friend. The actual (as opposed to estimated) temps could have been higher just as easily as they could have lower. I have been having been having a surreal time over on Jo Nova's forum. Other than the outright insults (I expected that), they have an odd policy that comments are automatically put into moderation if they contain the word "conspiracy". Considering the climate change dissenter's central argument is that various agencies are engaged in a conspiracy to manipulate the homogenised temperature data sets to show global warming where none exists, I find it odd the forum frowns upon conspiracies being commented on... what conclusion is one to draw from that? OT, but there's a great write up of the latest denierpalooza up on Ars Technica. That's a great read from Ars Technica. I'm becoming increasingly impressed with their climate change articles. They have it nailed. As you would if you understand the science. Meanwhile, Mark Steyn digs the hole he is in deeper and deeper. China Syndrome stuff, more popcorn please. As noted previously ... this release was so not about May 2015. I wonder how WUWT will try to squirm out of this one or do you think just try and ignore it? The 2014 report is quite the diagnosis. Could JMA's COBE-SST's be combined with land-based raw data to satisfy Anthony's longing for an "independent" comparison, for the major data sets? The Japan Meteorological Agency (JMA) has its own independent Global Sea Surface Temperature Data: COBE-SST. On its website there is a "Comparison with Other SST Analyses (HadISST, ERSST.v2)." "The land part of the combined data for the period before 2000 consists of GHCN...information provided by NCDC...,while that for the period after 2001 consists of CLIMAT messages archived at JMA." Per Wikipedia: "CLIMAT is a code for reporting monthly climatological data assembled at land-based meteorological surface observation sites to data centres...sent and exchanged via the...World Meteorological Organization." Similarly, "The Global Historical Climatology Network (GHCN) is a database of temperature [etc] records managed by the National Climatic Data Center [etc]. "This work has often been used as a foundation for reconstructing past global temperatures, and was used in previous versions of two of the best-known reconstructions, [NCDC & GISS]"
CLIMAT is filtered through the World Meteorological Organisation, an agency of the UN and by extension of Agenda 21, so I doubt it'll be accepted as independent. What this requires is a free-hand sketch drawn on a napkin, with more degrees of independence than you can shake a stick at.